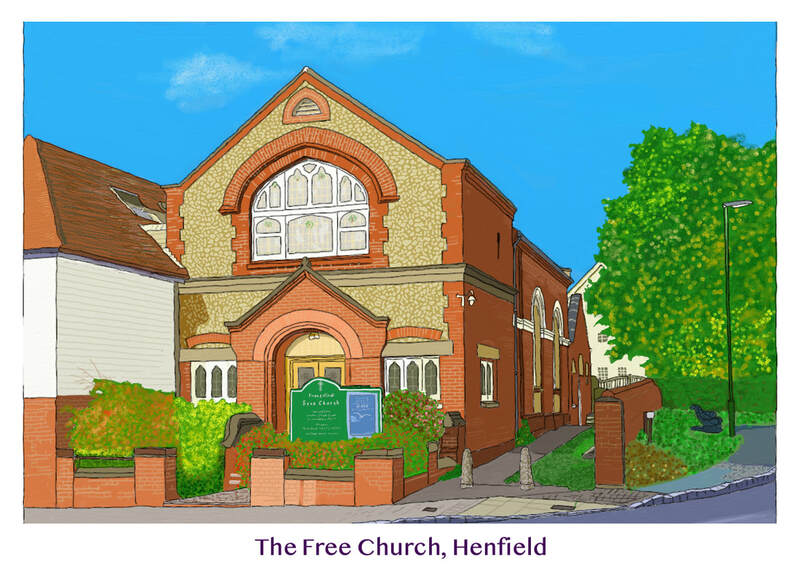 The original Evangelical Free Church was built behind its manse in 1832 in Henfield High Street, on the corner of the junction with Cooper's Yard. In 1841 and 1851 the minister was 48/58-year old George Hall from Emsworth, with his wife Sarah. The manse was demolished in 1904 to be replaced by the present extension, and the old church hall was replaced by a new hall in 1998. The last minister in the old manse was 49-year old Frederick Whiting, who is listed there in 1901. The members like to call themselves members of the Free Church, and this is how it is described on this website. Free Church: This photo shows the church, taken from the pavement by Barclay's bank across the High Street. Free church interior 1-3: Three photos of the church interior taken in 2015. Free Church: A photo from 1969, showing the church at the corner of Cooper's Yard, before the construction of Cooper's Way. Free church entrance: This photo, taken in late May 2018, shows the doorway and front of the church, with changes to the flowers growing.